As you can see, the cover page of this book looks old enough — 151 years old, to be precise. 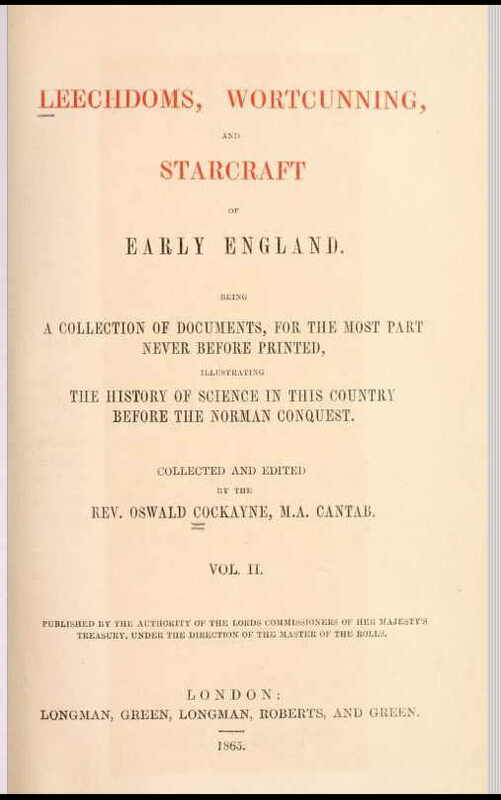 But you’ll notice that the title refers to “Early England” and the sub-sub-title refers to “before the Norman conquest,” so the information actually dates from a lot earlier than this edition’s publication date. Take a look at a typical page from the inside of the book, shown at the end of this post — barely readable today, right? Fortunately the 1865 edition includes not only the original but also a translation into more-or-less modern English. For those who are under the mistaken impression that Chaucer (or, even more inaccurately, Shakespeare) is Old English, look at this text! Barely readable, as I say. Looks no more English than German or Dutch do. English today has not only evolved naturally over a millennium, it was also shaped enormously by the French influx of the aforementioned Norman conquest. For sore lips, smear the lips with honey, then take film of egg, scatter it with pepper, and lay on. Take mugwort, seethe it in a copper kettle, and boil till it be very thick, and let it be wrought of wheaten malt; then take of ever fern most, bishopwort, water agrimony, pennyroyal, singreen, set all in a vat, give to drink at the middays, and forego what is sour and everything salt. So that’s all perfectly clear.